The advent of rugby was somehow an accidental birth from football, which explains the many similarities between the two games. Rugby began in 1823 when William Webb Ellis in total disregard of the rules of football, took up the ball in his hands and ran with it. One can wonder just how weird it looked when he did that, but that marked the beginning of a new game to be enjoyed by millions of people currently. He is the father of rugby as documented and as recognised by the current William Webb Ellis Trophy. Of course, the game was not acceptable until 1838-1839 when Jem Mackie made it so through a powerful run. It had taken time, but people were getting to appreciate it all around its origin. The run was a historical landmark towards making the game what it is today. Around the same period, the game had gained momentum and became legalized in the period of 1841-1842. This legalization was a huge step that also had the first rules of rugby written. The rules were to control it now that it was a contact game and could result in injuries. This change was the gateway to the spreading of the game far and wide. 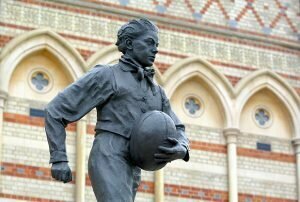 A rugby school was set up around 1859 to teach the game to many youths who were now in love with the new game. The rules were not as strict as they are currently. The formation of RFU is what now led to the modern Rugby played today. Before then, there were different rules used by each region, with different kicking and other features of the game. The formation of RFU in 1871 led to the unification and formation of new universal rules. Rugby has revolutionalized over the years but not so different from how it was back then in the early 20th century.